New this year: A NeoShockwave Therapy Unit! 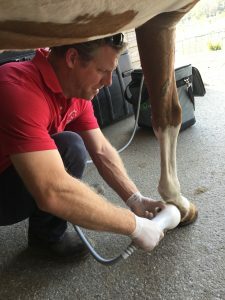 Many sport horse and lameness practices employ shockwaves into the treatment and rehabilitation of their athletes. Extracorporeal shock waves (ESWs) are acoustic (pressure) waves with a very high amplitude and rapid rise time. Our system uses a vaporization of fluid across a spark gap (electrohydraulic) and the pressure wave is brought to a focal point in order to treat a specific point within the tissue. The shockwaves simulate trauma without doing trauma which thereby trigger the body’s own healing mechanism. The original application of shock waves were in people to break-up uroliths and then was discovered to treat musculoskeletal injuries such as nonunion fractures, heel spurs, and tennis elbow. 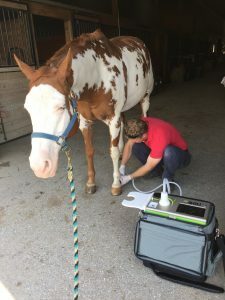 Application in the horse can include the following.